In chemistry, an oxidizing agent (oxidant, oxidizer) is a substance that has the ability to oxidize other substances — in other words to cause them to lose electrons. Common oxidizing agents are oxygen, hydrogen peroxide and the halogens. In one sense, an oxidizing agent is a chemical species that undergoes a chemical reaction that removes one or more electrons from another atom. In that sense, it is one component in an oxidation–reduction (redox) reaction. In the second sense, an oxidizing agent is a chemical species that transfers electronegative atoms, usually oxygen, to a substrate. Combustion, many explosives, and organic redox reactions involve atom-transfer reactions. 2, which accepts an electron to form Fe(C5H5)2. One of the strongest acceptors commercially available is "Magic blue", the radical cation derived from N(C6H4-4-Br)3. Tetracyanoquinodimethane is an organic electron-acceptor. Extensive tabulations of ranking the electron accepting properties of various reagents (redox potentials) are available, see Standard electrode potential (data page). 4 (perchlorate). Notice that these species are all oxides. The dangerous materials definition of an oxidizing agent is a substance that can cause or contribute to the combustion of other material. By this definition some materials that are classified as oxidising agents by analytical chemists are not classified as oxidising agents in a dangerous materials sense. 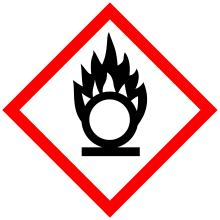 An example is potassium dichromate, which does not pass the dangerous goods test of an oxidising agent. The U.S. Department of Transportation defines oxidizing agents specifically. There are two definitions for oxidizing agents governed under DOT regulations. These two are Class 5; Division 5.1(a)1 and Class 5; Division 5.1(a)2. Division 5.1 "means a material that may, generally by yielding oxygen, cause or enhance the combustion of other materials." Division 5. (a)1 of the DOT code applies to solid oxidizers "if, when tested in accordance with the UN Manual of Tests and Criteria (IBR, see § 171.7 of this subchapter), its mean burning time is less than or equal to the burning time of a 3:7 potassium bromate/cellulose mixture." 5.1(a)2 of the DOT code applies to liquid oxidizers "if, when tested in accordance with the UN Manual of Tests and Criteria, it spontaneously ignites or its mean time for a pressure rise from 690 kPa to 2070 kPa gauge is less than the time of a 1:1 nitric acid (65 percent)/cellulose mixture." Wikimedia Commons has media related to Oxidizing agents. ^ N. G. Connelly, W. E. Geiger (1996). "Chemical Redox Agents for Organometallic Chemistry". Chemical Reviews. 96 (2): 877–910. doi:10.1021/cr940053x. PMID 11848774.